Every year in the NFL Draft there are players who are projected to be top-15 picks who were on almost no one’s radar as recruits. This year the two guys who stand out are Kentucky edge rusher Josh Allen and Washington State offensive tackle Andre Dillard. Allen was a 2-star recruit who wasn’t ranked in the top-2000 overall. He was the #46 player in the state of New Jersey and didn’t even have a Rutgers offer. Now he’s projected to be a top-five pick. Dillard was not ranked in the top-1500 recruits in the country. His only Power 5 offer aside from Washington State was from the Idaho. He’s now the top ranked tackle in the Draft. It’s always fascinating to me finding out how players like them slip through the cracks. One thing that both of these players have in common with others who developed into elite NFL prospects is that they put on a significant amount of weight once they got to college. Allen was 6’4” and 205 pounds as a freshman. He now weighs 260. Dillard was 6’5” and listed at 240 out of high school. He now weighs closer to 315 pounds. Allen never played defense until his senior season in high school. Dillard didn’t play football at all until 8th grade and admitted that he was terrible his first couple of years. These are two players that could have started for any program in the country and somehow less than a handful of Power 5 programs offered them a scholarship. Size at the time was obviously a pretty big factor, but it shouldn’t be as big of a factor for a lot of schools. Clemson or Ohio State might not need to take a chance on a kid that could grow into his frame, but what about these other programs who rarely have produce elite NFL prospects? Wouldn’t it be better to take more swings on individuals with high ceilings like an Allen or a Dillard? I guess it’s no different than an undrafted player like John Randle becoming a Hall of Famer or Tom Brady being a sixth round pick. College programs miss on recruits and NFL teams whiff in the Draft all the time. It just seems that with 5,440 scholarships to give out from the 64 Power 5 football programs playing FBS college football, players like Allen and Dillard shouldn’t fall through the cracks for so many programs. Yet, it’s something that happens every year and we’re always reminded of the misses by recruiting sites and college football evaluators every year when mock draft season kicks into gear. - Last year Alabama ended up signing nine players who were ranked in the ISD Fab 50. This cycle Clemson might do the same or even one up them. 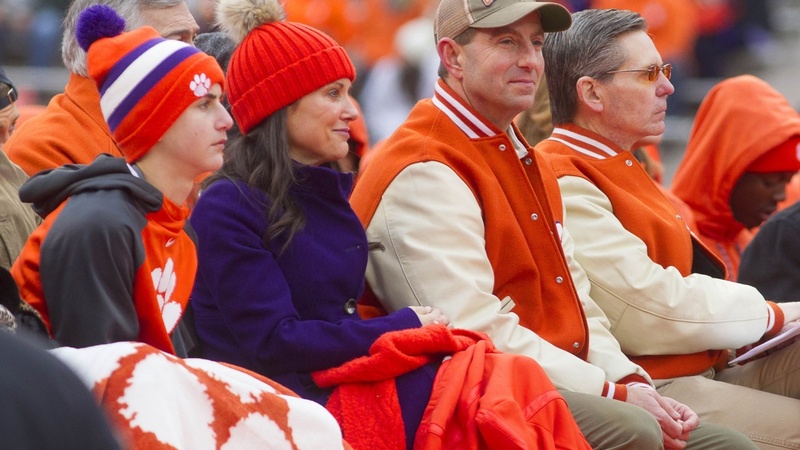 After picking up commitments from safety RJ Mickens‍ (#37 in the 2020 Fab 50) and corner Fred Davis‍ (#19) last week, Clemson is already at four commitments in the top-50 and they have a good shot at landing more than a few others. The good news is that all of these players will only be freshmen when they visit South Bend in 2020. The bad news is that Trevor Lawrence and Justyn Ross were freshmen last year and that didn’t stop them from being dominant. In more bad news, Clemson also visits Notre Dame in 2022 when all of these players will be in their third year. - Back to the good news, wide receiver Jordan Johnson‍ is the first wide receiver commitment Notre Dame since Michael Floyd who could end up as a consensus top-50 prospect overall. That’s where going 12-1 can make a big difference. - Several invites aren’t out yet and there are still a number of regional camps in the coming weeks, but out of the 55 players who have been invited to compete at The Opening Finals, only 16 are currently committed to a program. Clemson has three of them. Texas A&M and Miami both have two each. - Quarterbacks who have been invited to the Elite 11 Finals, like Notre Dame commit Drew Pyne‍, are not included in that because they still have to be one of the top-12 quarterbacks at the Elite 11 to then move on to the The Opening Finals in Dallas. Seven of the nine quarterbacks invited to that event are already committed to a program. - Coming off a 4-8 season and with a coach who has gone 9-27 in three years, it would seem shocking that a program would have recruiting momentum. But here we are with Illinois picking up two big commitments this week in receiver Jadon Thompson‍ and running back Reggie Love‍ (he was offered by Notre Dame earlier in the process). They also just picked up a former highly touted recruit as a transfer in Wole Betiku (previously at USC). These are the kind of commitments that make news now, but if Illinois wins four games again and Lovie Smith gets fired, then they’ll just be a reminder of what could have been. - The under the radar recruit of the week really isn’t that under the radar so maybe this is cheating a bit. I’m picking him anyways because I think he’s someone who has a chance to blow up a lot more during the process. Safety Alaka'i Gilman‍ is the brother Alohi Gilman. Alaka’i has six offers, five of them from Pac-12 programs so it’s not like teams aren’t aware of him. It’s just that I have a hunch that he is a bit of a later bloomer, similar to his older brother, and I wouldn’t be surprised if those scholarships doubled after the May evaluation period. He’s a consistent playmaker on film even if he needs to clean up his footwork and technique quite a bit. He certainly seems like he has at least a bit of the edge of his brother too and that kind of thing is invaluable to a defense in my opinion. I don’t know if Notre Dame will choose to get involved, but I think many other programs will in the next couple of months or after watching senior film.